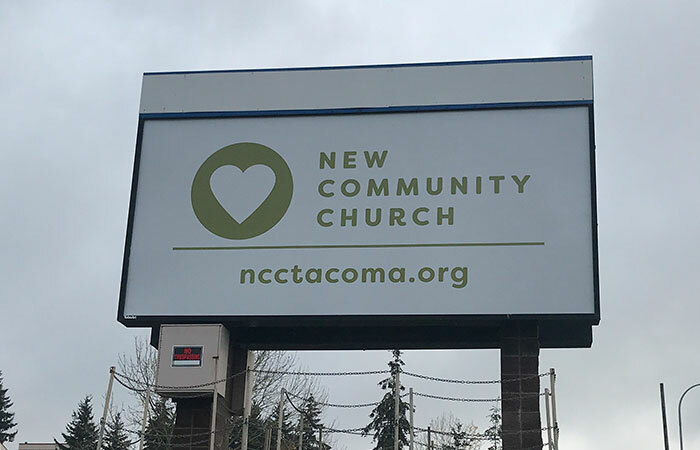 New Community Church (NCC) is a Tacoma based church that recently changed locations to a new and improved location on 23rd Street. 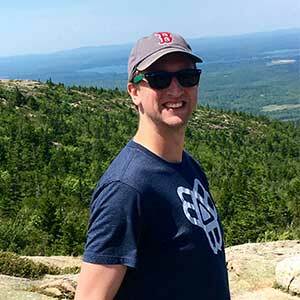 They came to us through our relationship with local marketing and design agency, Hemisphere. Hemisphere worked with NCC on their new branding and logo. It’s always a great feeling to be a part of such a locally driven project with 3 Tacoma based businesses working together towards a common goal. Exterior signage at the entry. A roadside pylon sign to expand the line of sight and reach of their brand. 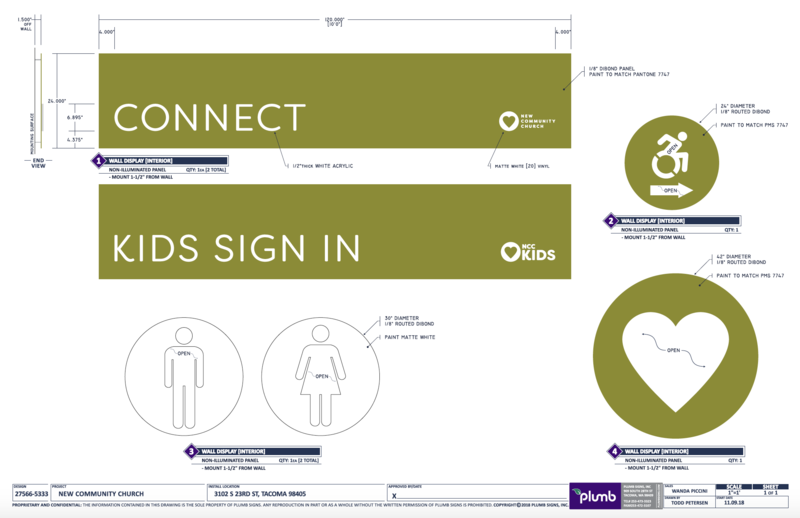 Interior signage to carry on their new branding experience from the exterior throughout the interior. 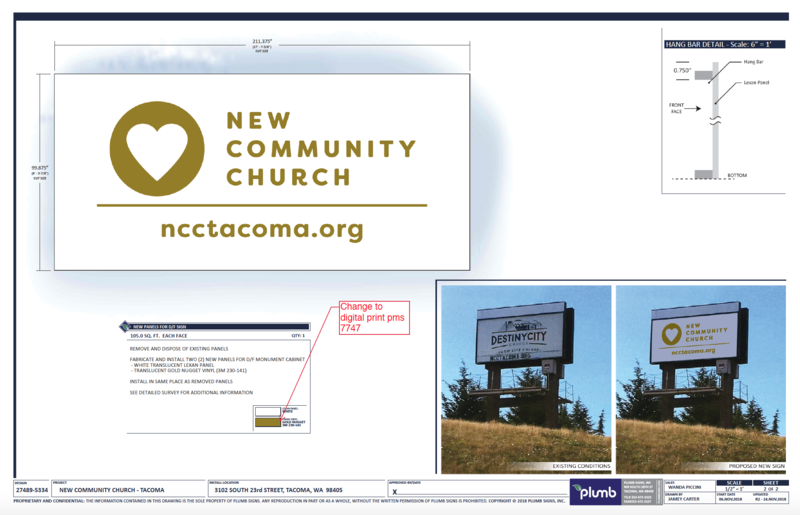 This was a pretty standard “new location” sign package so we were ready to hit the ground running with the team at NCC. As with any sign project, we faced some small challenges but nothing our team wasn’t prepared to handle. 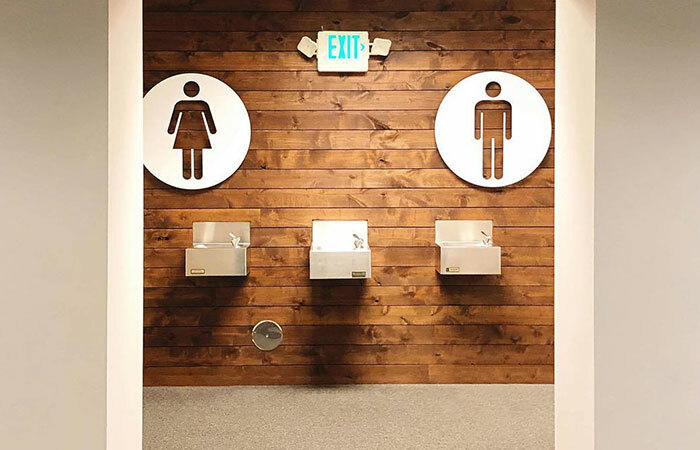 The NCC project had some time constraints given the grand opening date had already been set so we had to make sure we had all of our ducks in a row and moved efficiently as possible through each phase of design, production and installation. Given the scope the of the project, we felt the deadlines set were achievable as long as there were no setbacks. Our team was able to move through each phase seamlessly and hit the deadline for NCC. Another challenge that comes up from time to time is having to custom match paint and vinyl colors with design colors of new branding guidelines. 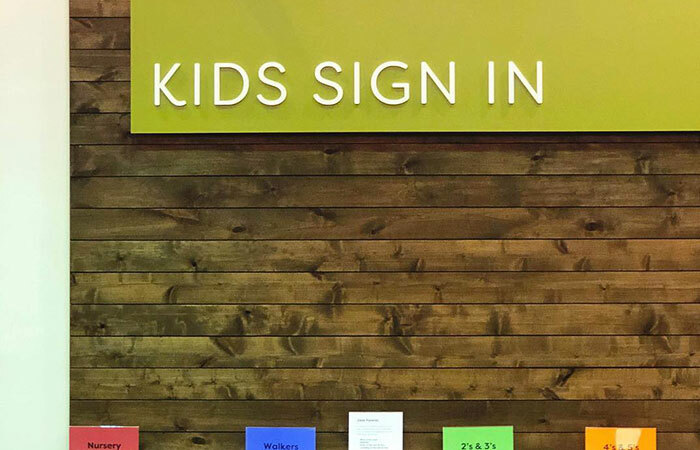 A lot of outside design work doesn’t exactly match what is standard when it comes to vinyl and paint colors in the sign industry so our team has to do some custom matching. 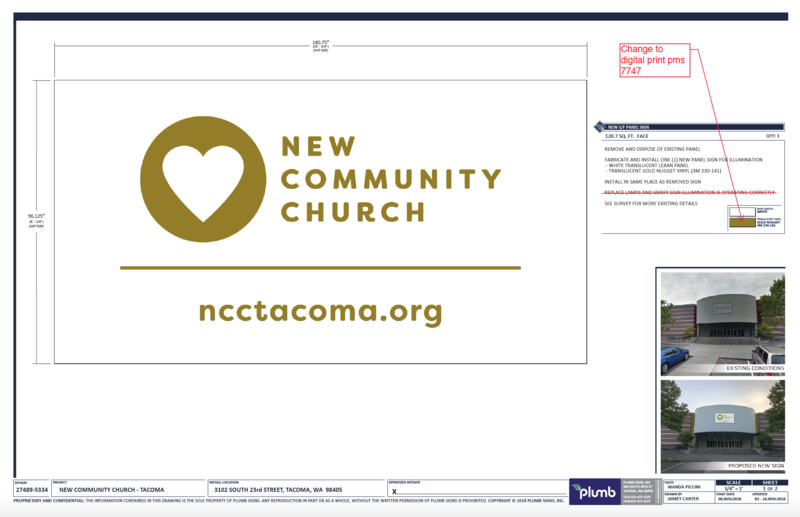 In this case, the gold color (gold nugget) within the NCC logo needed to be custom created by our team. Through a lot of trial and error our guys were able to match the color exactly, which may seem pretty like a small obstacle to some but it’s actually quite difficult to do and we were relieved our team was able to make it happen! As mentioned in the challenges section, the color matching could have caused some issues and the result could have been a slight variation from that of their new branding guidelines. However, due to our experienced team we were able to get an exact match of the color so that their brand was consistent across the board from their signage all the way through to their social media presence. Our experience also allowed our team to be able to move quickly through each stage of the project and hit the deadline set for the install without any issues. It was a pretty tight turnaround but at no point was there any doubt that the project wouldn’t be completed in time and that’s a testament to the crew we have working behind the scenes. 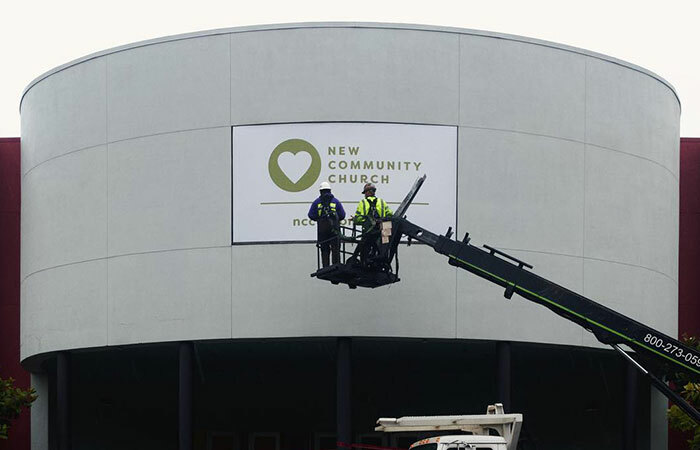 We had a lot of fun teaming up with the Hemisphere team at the start of the project and providing NCC with a great sign package for their new building! Any time we have a chance to be a part of growth in the local community it’s an absolute pleasure. 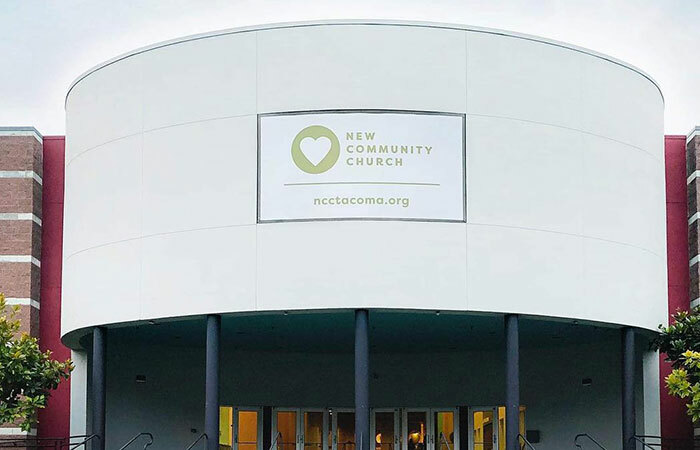 We hope NCC enjoyed working with us as much as we did with them and we hope their future in their new building shines as bright as their new signage!